RAPHaEL 2 is the second generation of robotic hand created by undergraduates at Virginia Tech's Robotics and Mechanisms Laboratory. The new, improved device just won First Place in the American Society of Mechanical Engineers (ASME) Student Mechanism and Robot Design Competition at the International Design Engineering Technical Conference. The original RAPHaEL (Robotic Air Powered Hand with Elastic Ligaments) (see also video) was also powered by compressed air. The new version, RAPHaEL 2, uses closed loop control mechanism and sensors for automatic position and force feedback of the fingers using LabVIEW and data acquisition hardware donated by National Instruments. The new RAPHaEL 2 also uses a more durable polycarbonate material for the fingers. Take a look at this short video demonstration of the RAPHaEL 2 system. 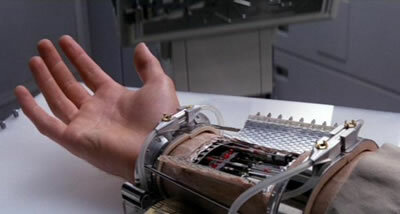 SF fans of course remember the steel cable version of robotic hand that Luke Skywalker gets in Star Wars after an argument with his father.